Silverlens Gallery is proud to present Play, a much awaited solo show by veteran photographer Neal Oshima. Opening on April 15, Wednesday at 6pm, Play will be composed of two sets of works: callotype still life prints, and large cyanotypes. The show will run until May 16, 2009. Neal Oshima has shown in numerous galleries around the world, namely Sepia International in New York City, and most recently in the Museum of Contemporary Art and Design of the College of St. Benilde in Manila. His works have been published in books such as Dreamweavers, which captures the T’boli weavers of the Philippines, Memories of Philippines Kitchens and the award-winning The Philippine Forest: Our Living Heritage. Oshima grew up in New York City, and has an MFA in photography from University of California San Francisco. He is now based in Manila. 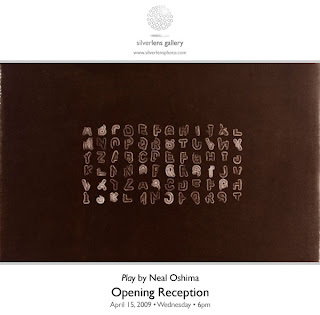 Neal Oshima figures the dynamics of play in his exhibition of photograms at Silverlens Gallery, April 15 - May 16, 2009. Play in this set of works is, however, an ironic topic, because the photogram process has a severe, straightforward, almost anti-play temper. Still, play “resides” in the photographer’s object, a range of toys and children’s playthings, from edible gummy bears and gummy worms to plastic modular building sets to mini guns. Play may also be located in visual double entendres emerging from the process itself. With the objects in actual contact with the surface of the paper—for this exhibition, arranged in very orderly, symmetrical grids—the toys are about as close to their images as physically possible. Simultaneously, these things are about as distant, visually, from toys as one might wish to imagine. The gummy worms, organized in overlaid x’s or curves, look as though a strange, translucent set of chromosomes. Or codes (which, in any case, comprise genetic material). Or a kind of unfamiliar writing. Serious stuff, which will remind semioticians, Buddhists, hackers and virus-makers, and, of course, game creators, that post-industrial humans think of the universe, their social relationships, and indeed their own bodies in terms of codes. But Oshima will not really humor these thoughtful viewers. His twist: these are, of course, only gummy worms and Lego bits. There is nothing more in the images that the direct imprint of these children’s playthings on exquisite paper the photographer himself chemically sensitized to light. A further twist: the images are not even mediated by light traveling any distance, nor computer manipulation. The compositions perturb because they re-initiate adults into the nether dimensions of play. Weapons that maim and kill, creepy-crawlies that are a challenge to ingest, models of dangerous equipment, transgender role-play, and so forth, all exist within a liminal zone very close to the most transgressive human actions. The notion of “play” renders the dangerous, safe; the unknown, familiar; the evil, domesticated. Play also wraps the imagination around the menacing and the uncanny, the outcome of which, for the child at play, is by no means exclusively beneficial. Barbie, the extreme example, is not only an image of the disciplinary impositions of a horrific sexual social order; the quasi-doll is perhaps more importantly, a signal towards actual illnesses (anorexia being the mildest). It is in this light—light, so to speak, in Oshima’s deadpan photography—that there is delight in this exhibition. Oshima brings up the complexity of play in an apocalyptic world, but does not play up to the romance of apocalyptic visions. A peerless technical virtuoso, he plays with a lightness of touch, and a calm intelligence. To know more about this art exhibition and others, please click here. Play by Neal Oshima opens at 6pm on April 15, Wednesday and runs until May 16, 2009. Play will be shown alongside between the sea and the sky by Christina Dy at SLab (Silverlens Lab) and Cut Out Atma by Mac Valdezco at 20Square. Silverlens Gallery is at 2/F YMC Bldg. II, 2320 Pasong Tamo Ext., Makati, 816-0044, 0905-2650873, manage@silverlensphoto.com. Gallery hours are Monday to Friday 10am–7pm and Saturdays 1–6pm. www.silverlensphoto.com.